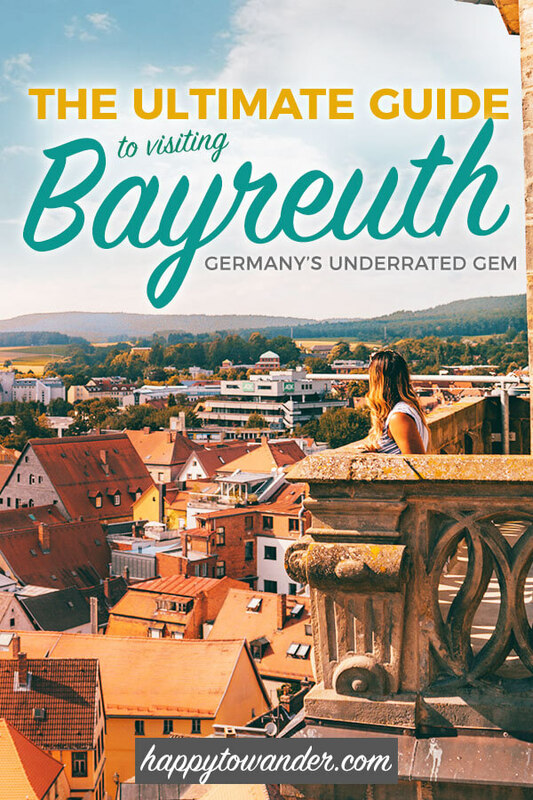 This guide to Bayreuth, Germany was written in collaboration with Bayreuth Tourismus and Marketing. My recent visit to Bayreuth, Germany marked a series of important life lessons. Firstly, that day drinking is a responsible and noble endeavour when done in the name of culture… and secondly, that the best way to score the castle of your dreams is arson. … wait. Allow me to explain that one. You see, once upon a time, a daring young princess named Wilhelmine trotted down from Berlin to Bayreuth to meet her new royal hunk Margrave Friedrich. Upon arrival, she was disappointed. Not by Friedrich (I assume he was adequately hunky), but rather, she was dismayed by the lack of royal pizazz in her new home. Where was the grandeur?! Where was the opulence?! The champagne showers and the Versailles glam she had probably saved on 18th century Pinterest? Eventually, she did what any reasonable woman would do – she set her crappy castle on fire, in favour of a shiny new castle that she’d get to design herself… adding on to her already extensive list of ‘projects’ around Bayreuth, like building one of the world’s most stunning opera houses, redesigning the decadent Ermitage gardens (which she, duh, received as a birthday gift) and adding all sorts of splendid & impressive buildings to the Bayreuth cityscape, successfully turning it into the Baroque powerhouse that it is today. And sure, while this story might have been embellished by my guide for a laugh or two (there’s no official documentation of Wilhelmine being the actual cause of the fire, though anecdotal evidence is compelling), one thing remains crystal clear: Bayreuth is one very good looking city… and much of that is thanks to Wilhelmine. But first – some context. Not to be confused for the Lebanese capital of Beirut (which is, supposedly a too-common mistake), Bayreuth is a city in Germany’s Upper Franconia. You might recognize the name for its Richard Wagner Festival, a month-long summer spectacle that attracts culture vultures like hipsters to avocado toast, turning Bayreuth into THE place to be for a few weeks of the year. And while Bayreuth often refers to itself as a city of Ws: wheat beer, Wagner, Wilhelmine, I’d like to propose a new addition, which is woah, why have you not heard of this place before? … That, my friends, is an excellent question. 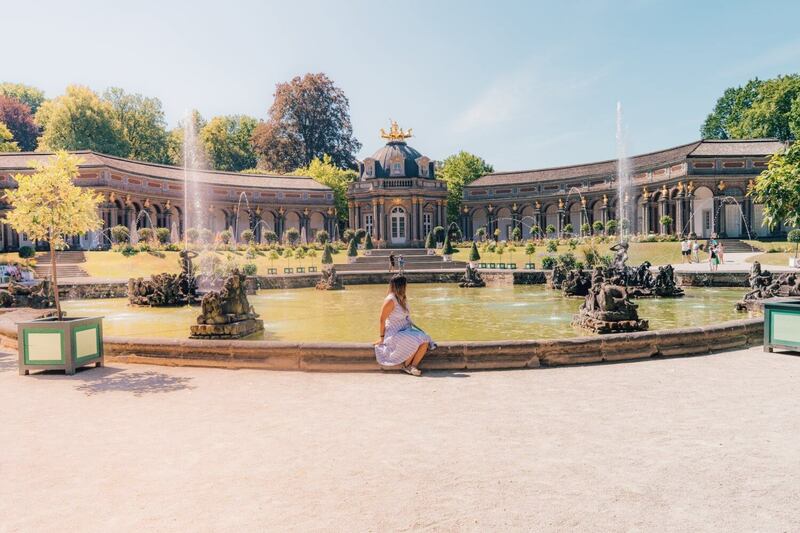 So, if I’ve piqued your curiosity with my tales of arson and royal drama, read on for a detailed guide to Bayreuth, Germany, including why you should visit, things to do and where to stay. Tell me in the comments: have you ever visited Bayreuth, Germany? 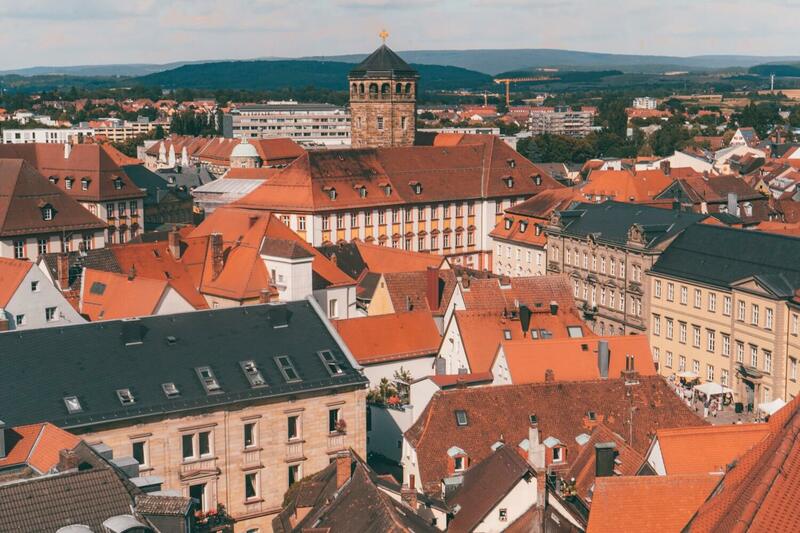 The first time I ever heard of Bayreuth, Germany, it was gazing at me from the label of a delicious, cold beer – one of the best beers I’d ever tried actually. It would therefore be tempting to say that the key reason to visit Bayreuth is for beer. After all, beloved writer Jean Paul, a key figure of the city, used to purportedly get so drunk at a pub just outside town that he would literally roll home (yes, down a hill). If that’s not #goals, I don’t know what is. As I mentioned before, Bayreuth is a city of Ws: Wheat beer, Wagner, Wilhelmine & wfun things to do. Duh. Sorry. Had to get this one out of the way. The reason I keep talking about beer is simple. Beer is Bayreuth, Bayreuth is beer. Beer is such a big part of the culture here, I’m quite certain the babies here are bon with tiny glasses in their hands, exiting the womb while slurring the chorus to Sweet Caroline. But seriously though – you know how people often say that Germany has the best beer in the world? Well others often say that Bavaria has the best beer in Germany… and some might even add that Bayreuth has the best beer in Bavaria. So amidst all those layers of “best”, you’re guaranteed a tasty brew or two. Long story short: Bayreuther bier is a must try when in Bayreuth. 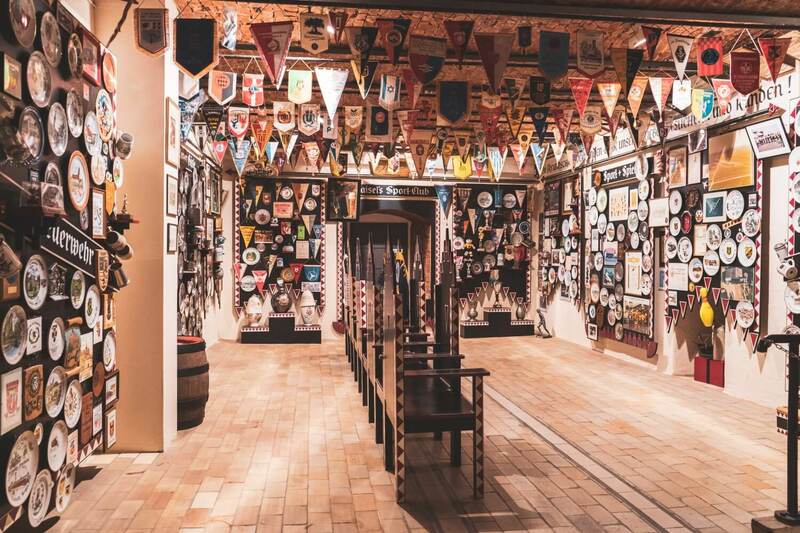 Once the world’s most extensive beer museum (as certified by the folks at Guinness World Records), this museum is far too cool to be called a museum, hence the aggressive name “BEER ADVENTURE WORLD”. It truly is an adventure though, if you’re a beer nerd like me. 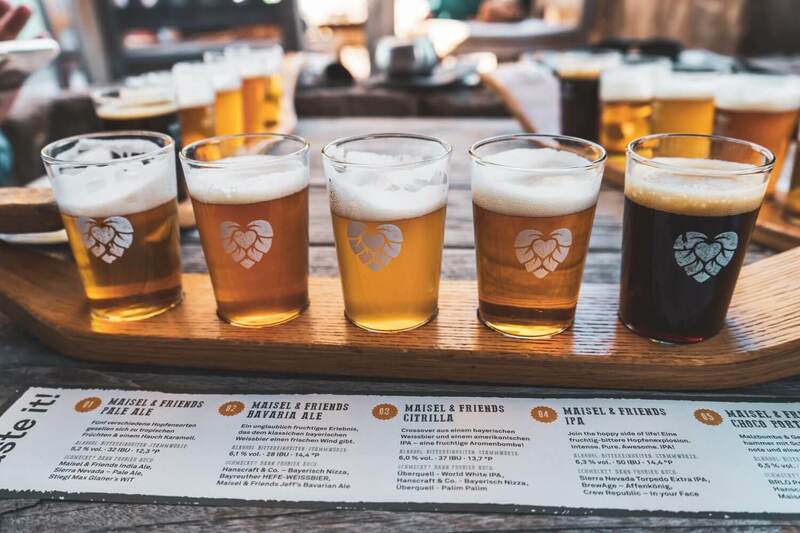 Here, you can marvel at giant rooms filled with gorgeous displays of beer glasses, galleries packed wall to wall with vintage beer signs/posters and of course, end your visit at Liebesbier, the in-house restaurant which has delicious food and generous beer samplers. Just down the street from Maisel’s Beer Adventure World is another one of the city’s starring beer attractions: the city catacombs. And while these catacombs never housed skeletons or dead bodies like their catacomb-y counterparts in Paris, this network of tunnels had even more precious cargo: BEER! 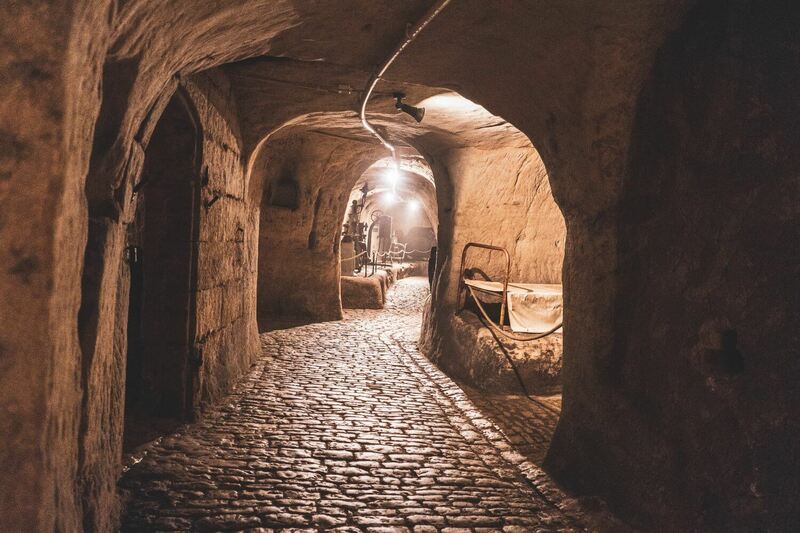 The chilly underground tour offers welcome refuge from the scorching heat (if you’re visiting in the summer) and provides insight into these historic underground parts of the city, which even once served as makeshift bomb shelters during World War II. For a small city, Bayreuth has a surprising number and variety of museums. Whether you’re interested in art, music, or… um… tobacco history, there’s something to satisfy your whims between beer breaks. The German Typewriter Museum: A museum dedicated to typewriters, with over 360 historic typewriters on display. Admission is free too! The Small Poster Museum: A Museum dedicated to contemporary poster art. The Other Museum: A museum housing cultural artifacts that you’re free to browse, read and touch. NOTE: Visitors are advised to call in advance to double check operating hours. 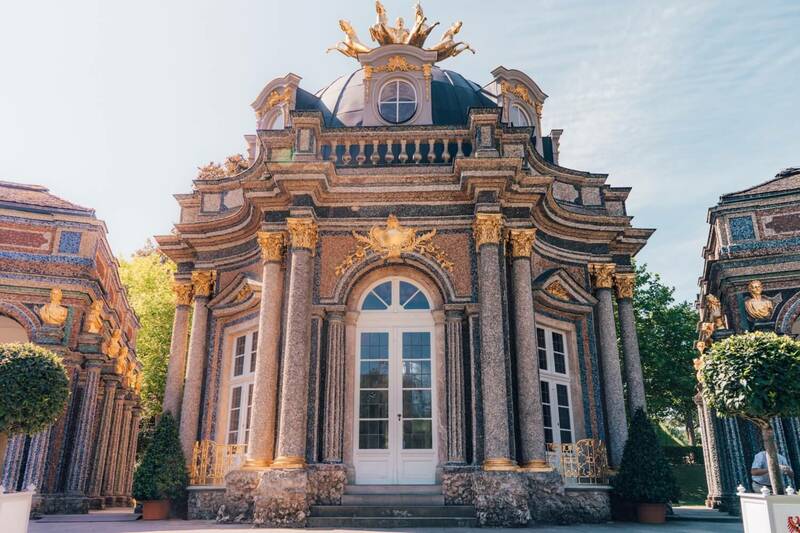 Located on the outskirts of Bayreuth is a beautiful Baroque complex filled with ornate buildings, opulent gardens, elegant fountains and cool little grottos. Yes, this was the complex once gifted to Wilhelmine for her birthday, a complex she immediately got to work on “improving”. Fair enough though, she did an incredible job, and today the Bayreuth Eremitage is a historic fairytale setting with plenty to fawn over, especially the incredible Sun Temple which is literally studded with gleaming details. Don’t miss the waterworks here! The fountains are turned on once an hour from May to October every hour, at the New Palace from 10am-6pm and at the Lower Grotto from 10:15am – 5:15pm. As I previously mentioned, every year, Bayreuth makes headlines for its Richard Wagner Festival in August, which is when Bayreuth becomes THE hotspot for culture conoisseurs. With a star-studded audience packed with swishy VIPs (Angela Merkel is a frequently spotted in the audience), getting a ticket is no easy feat, but taking a tour around the theatre is! Perched on top of a green hill over Bayreuth, this opera house is one of the largest in the world, and a worthy must-see. Speaking of opera houses, this Baroque masterpiece of an opera house is so opulent and wonderful that it is now a world heritage site recognized by UNESCO… and for you hipsters out there, it only recently re-opened in 2018 after years and years of renovation, so now’s the time to see it before most do. And seriously, this stunner is a real must-see. Modelled after some of the finest opera houses in Europe, it oozes in SO MUCH DETAIL, made impressively primarily of wood and canvas. A dramatic 3D effect is accomplished through Baroque illusionist art and really, your head will hurt a little from looking up so eagerly. Fun fact: this opera house was once home to a blue velvet curtain so luxurious that Napoleon straight up just took it as his own. Hands down, the most stunning view you can get in Bayreuth is from the City Church (Stadtkirche). Thanks to its central location in town, the church offers the perfect opportunity to perch like a gargoyle and gawk at the beautiful orange rooftops of the city center. Best of all, they offer guided tours to the public on a donation basis. For more information on when you can tour the towers, visit the official church website here. FUN FACT: It used to be a guy’s job to live up here (with his whole family) and spot fires/alert the town when they came up. While this already sounds truly insane, they actually bring you into his living quarters as part of the tour, and it’s only then that you appreciate how insane it all really was. Besides our favourite little badass, Wilhelmine, Bayreuth is perhaps most commonly linked to one man: Richard Wagner, German composer extraordinaire, known best for his operas (and for being a bit of an egomaniac). It therefore makes sense that you’d like to retrace his footsteps, or at least visit some of the most significant spots of his career. Besides Wagner’s Festspielhaus (that opera house he had specifically built for HIS operas), there is also a Richard Wagner Museum located close to the New Palace. Here, you can even visit Wagner’s unmarked gravestone, intentionally left that way because he declared “those who come here will know who they’re looking at”. 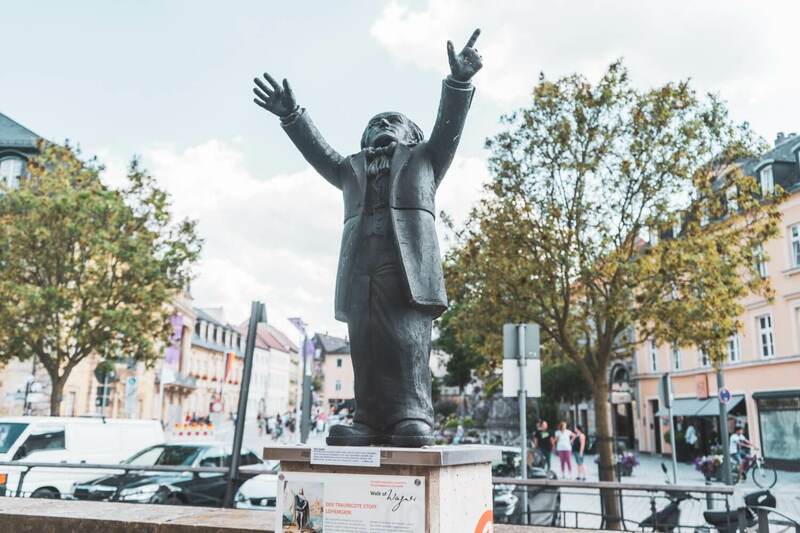 Last but not least, keep an eye out for funny little statues of Wagner that mark different pieces of the city’s “Walk of Wagner”, which marks significant spots that pertain to Wagner’s life, starting with his former family home, Haus Wahnfried and ending at the Festspielhaus, naturally. Maybe Wagner just wants a hug? 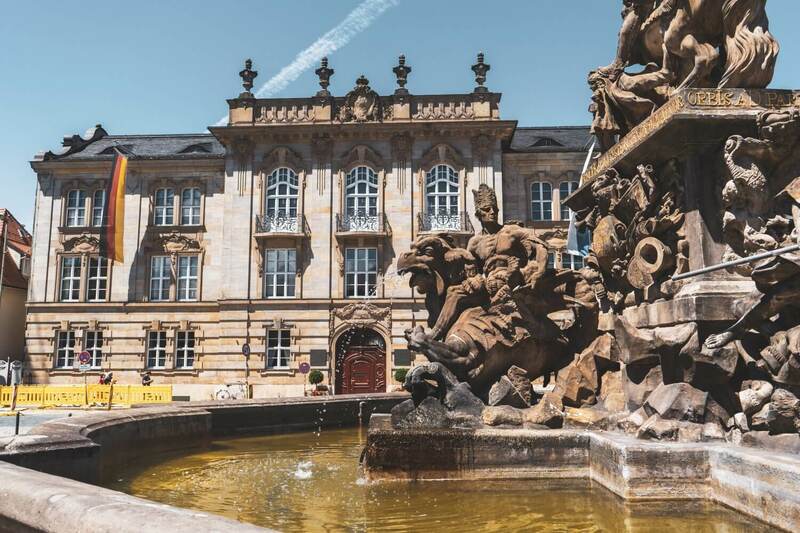 Commissioned by Wilhelmine, and with some rooms designed by her as well, Bayreuth’s New Palace is a delightfully pretty rococco gem in the city center that’s well worth a visit. The star of the show here of course is the court garden, which will give you some serious Sound of Music vibes. Now, despite being a small city, the Bayreuth festival calendar is jam-packed with awesome events throughout the year. I got to be in town for the Bürgerfest, which to my dismay had zero to do with eating hamburgers and more to do with having a bumpin’ party for its citizens (AKA burgers in German). Still, it was fun. You can check out a full list of Bayreuth’s event highlights (with exact dates) on their official website, but here are some to keep on your radar. If you can plan your trip around attending one of the city’s festivals, that would be a great way to see the city at its most vibrant. 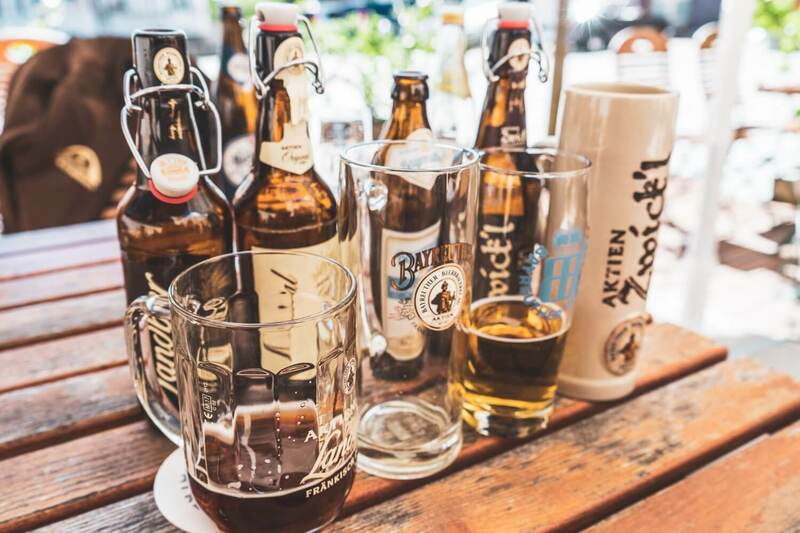 Maisel’s Beer Festival – May: A big beer festival welcoming thousands of eager beer drinkers every year on the Maisel Brewery Grounds. 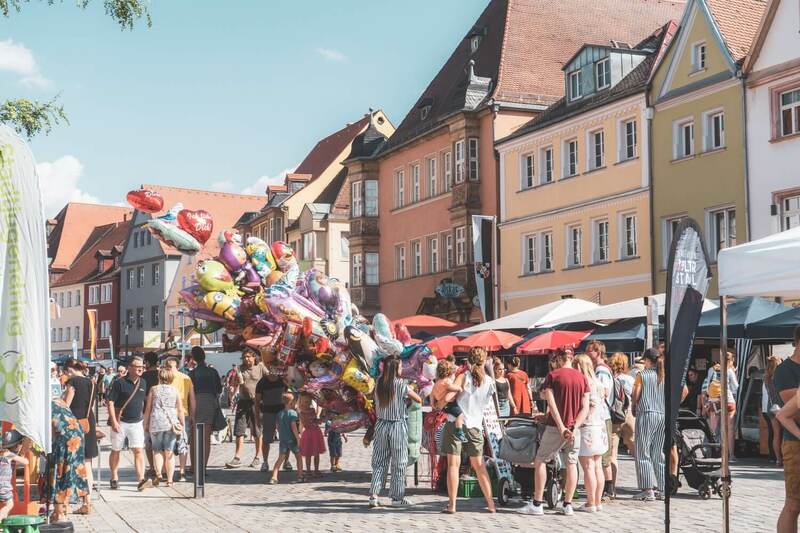 Bayreuth’s Citizen’s Festival (AKA Bürgerfest) – July: A big street party that overtakes the main city center with countless stalls, parties and booths. Bayreuth Summer Night’s Festival – August: A beautiful summer festival set at the Eremitage with concerts, musical performances and of course, dazzling fireworks. 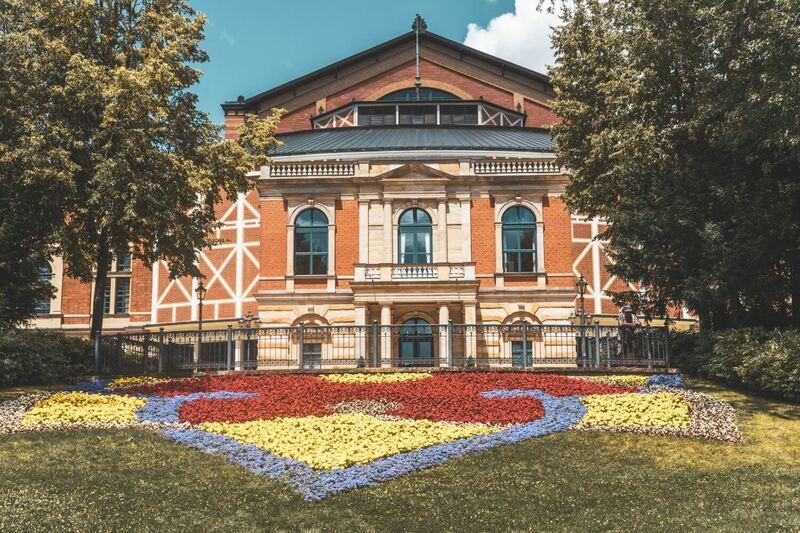 Richard-Wagner-Festival – August: The most famous festival in Bayreuth, and the reason why thousands flock to the city in August. Scoring a ticket to the festival is no easy feat, but it’s THE biggest event of the year. Bayreuth’s Jazz-November: Jazz concerts spread out over multiple venues across the city. Bayreuth Christmas Market – End of November to December 23: Time to swap the beer for sweet gluhwein! Christmas time is a magical period to enjoy Germany, and Bayreuth is no exception, providing a glorious Baroque backdrop for traditional German Christmas charm. If coming from within Europe, I recommend using the free website GoEuro to compare the different transportation options for arriving in Bayreuth. COMING TO BAYREUTH BY PLANE: The closest international airport is in Nuremburg. From there, there are quick trains that leave hourly towards Bayreuth. COMING TO BAYREUTH BY TRAIN: Bayreuth’s central train station is conveniently located in the center of town and train access is easy via nearby hubs like Nuremburg. Again I would use GoEuro to check out the different options or the official Deutsche Bahn website. COMING TO BAYREUTH BY BUS: Flixbus has many routes that pass through here, making it a quick and convenient option within Germany provided that there are no delays. You can read my full Flixbus review here. COMING TO BAYREUTH BY CAR: Bayreuth can be easily reached by car on either the A9 or A70 Express Ways. So, if you do plan on visiting, you might be wondering where to stay in Bayreuth. Here are a few recommendations for you! No fires though, please. There are plenty of hotels in Bayreuth to choose from. I stayed at the Hotel Rheingold, which was very nice, comfortable and well-located. It definitely has a more business-y feel rather than a cozy/homey one, but the breakfast was great and we were only a 10 minute walk from any point of interest. Click here to browse availability and prices. Curious to browse your other options? Click here to check out dozens of other hotels in Bayreuth. And so, I hope you found that (insanely long) travel guide to Bayreuth, Germany helpful! Let me know in the comments if you have any more questions. This sounds like my kind of destination! 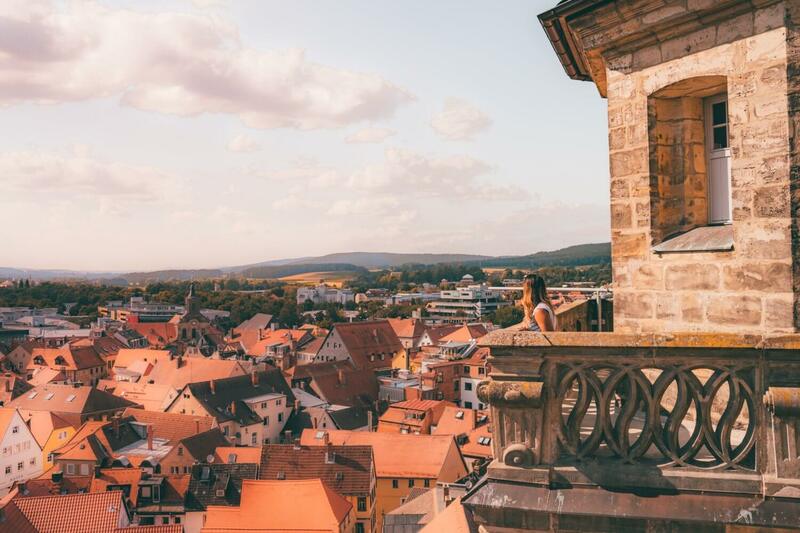 The view from the Bayreuth City Church looks magnificent, and as I’ve gotten really into beer lately, I would love to check out the Bayreuther beer scene. You are right, why haven’t I heard about Bayreuth before? It is now firmly on my list for my next trip to Germany, and I think even hubby will approve thanks to the beer! Lol, I love the arson story. I don’t think it would go over as well today! This is so amazing! This is the type of vacation that I like. 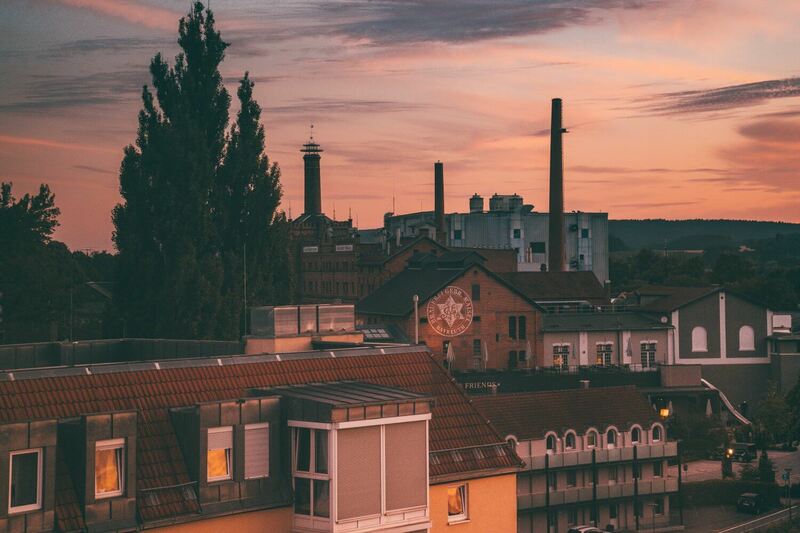 Germany is one of the places I can’t wait to visit, mostly for the beer! Wow this is such a detailed guide. Loved it. Inspires me to explore Bayreuth.i never heard about it before. This looks so amazing! Your photography is fab and now I’ve added this to my Germany bucket list!! OMG I think I got a little tipsy just reading it!! I’ve never heard of Bayreuth before, so I’m happy my first introduction was fun and exciting – I NEED TO GO NOW! Is it far away from the other major German towns? In any case, Bayreuth is definitely added to my Eurotrip agenda! This town looks so cute! And I would have loved to have met Wilhelmine, she sounds so interesting! This is such a wonderful post! The town looks magical and I can’t wait to visit! What a conincidence I found your lovely article. I am from Munich and am planning a trip to Bayreuth, which I only visited as a child with my parents. Your article with really beautiful photos helps a lot to plan the trip. Thanks for sharing. Definitely learned something new today AND will be visiting this charming city soon! How have I not heard of this?? 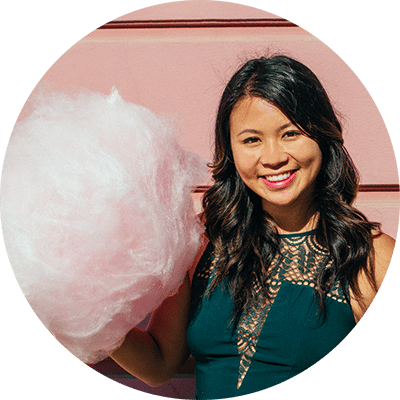 I loved your historical factoids to the locations – super funny! Bucket listed for sure! Great piece!